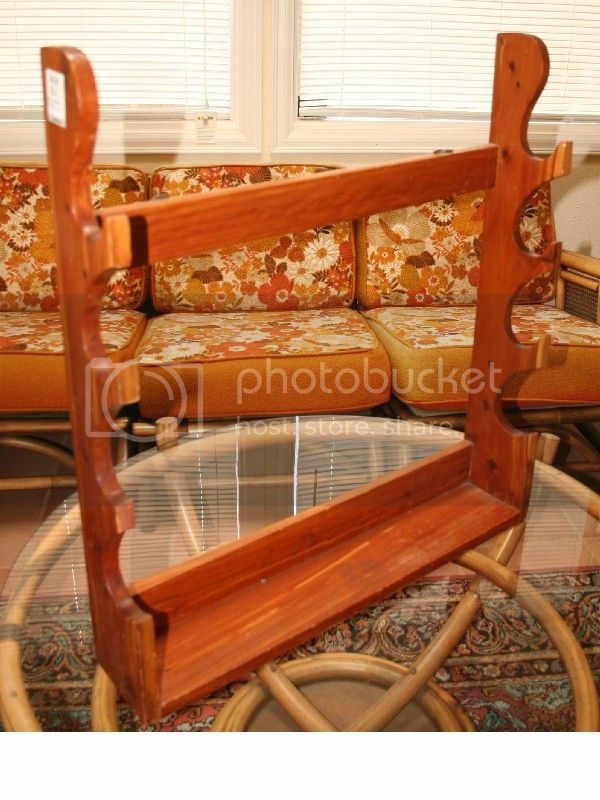 I found this old gunrack..probably somebody's old high school project..cost me a whoppin' $4!It's made of some nice Tennessee Red Cedar and had enough clear wood in it for "restorin" it to something more worthwhile.. 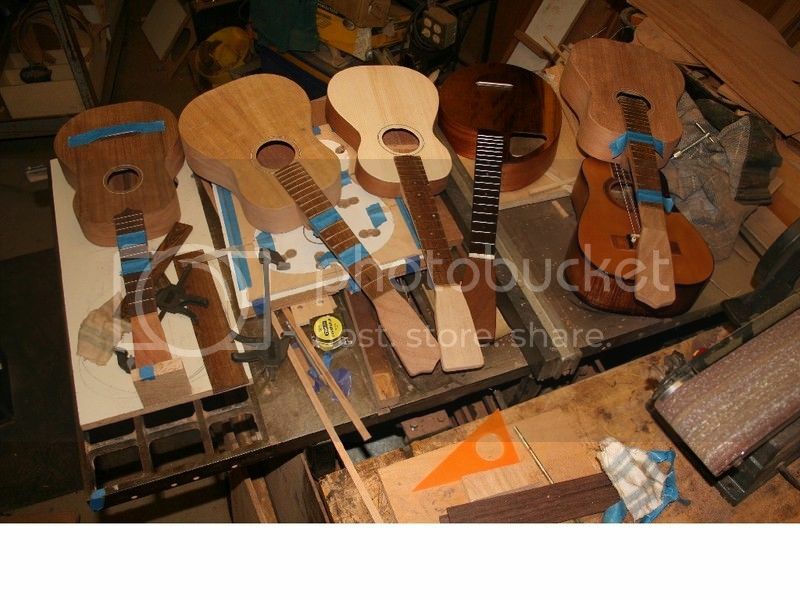 I got enough wood out of the gunrack to probably make another soprano..except I'll have to use a different wood for the neck... ..maybe I'll hunt up some more of the TR cedar..Hmm..I remember seeing an old small bookrack of that cedar recently.. Beautifully done, Cuz! You are a true craftsman! 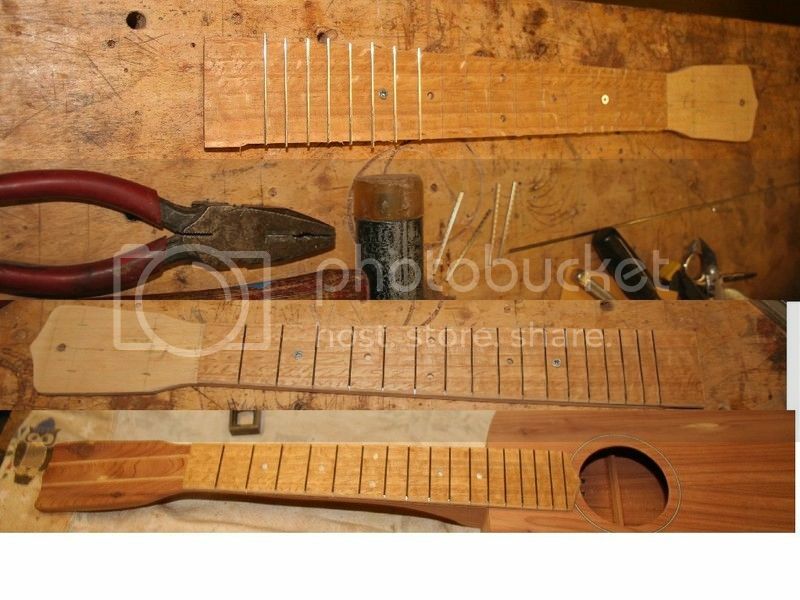 Just before those..I built an 8 string skinny traveler(gone to Maui)a "pickman" concert prototype,a 1932? The Gibson tenor copy(also restored The Gibson itself),a koa concert,a koa tenor,a tiple,and restored a couple unique baritones(4 and 8 string ones) to "Octave" ukuleles..I also restored a couple old 1910-20 Hawaiian ones(one just went to NY)...I've been busy the last few months..
That's what you have to do if you only have 3/4" thick wood..laminate 3 pieces with a couple matching strips of the contrasting wood..There is another method of making necks that use a single 3/4" piece of wood as wide as the neck..cutting the head portion off at 15 degrees and then reversing that portion and gluing it back on at the head angle..however..it leaves a weak spot between the neck and the head and looks like hell to me..usually requires a solid plate of wood on the head under the tuners to cover up the joint and it shows underneath.. 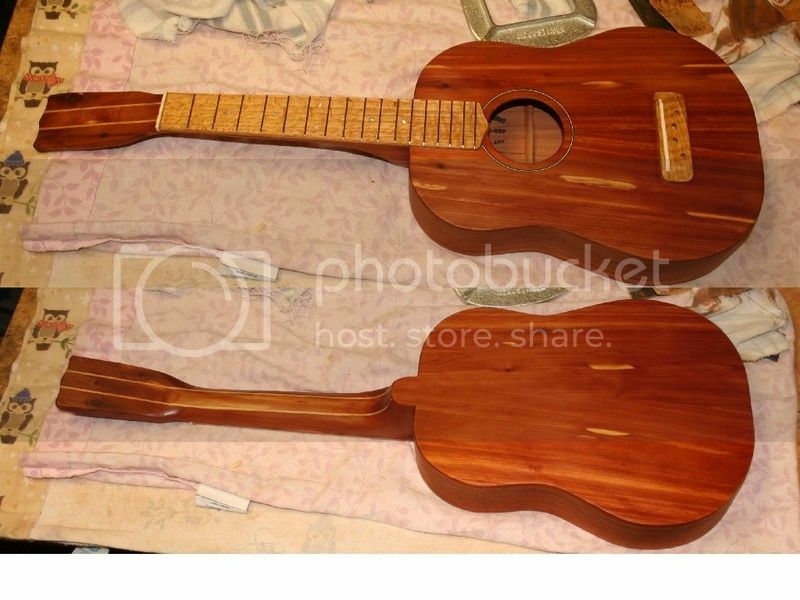 I'm making the second neck/ukulele the same way but maybe a smaller pineapple shape..get the largest body I can out of the wood that I have. Do you hand cut the groves on the fret board? 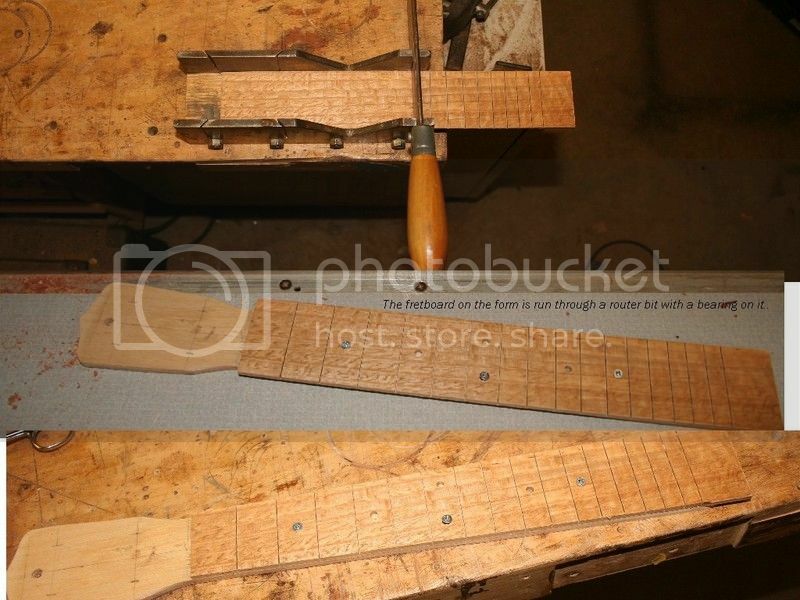 Okay..the 1-1/2" thick neck blank is run through a bandsaw on one side to get the angle on the head and the portion of the heel..then a "neck form"(shown below) is centered and screwed to the top of the neck where the fretboard ends up and the neck is run upside down against a bearing on a bit to the form..creating the shaped neck blank that needs to then be finished shaping by hand(after gluing on a heel piece extension for the proper depth) on a 4" wide table belt sander..back of the neck rounded,head shaped,finish sanded and slots for sides cut. The fretboard starts as a square blank .130 thick x about 2" wide(made of various exotic woods) in longer lengths and cut to length to what is needed.The frets are laid out on the square blank according to a Martin or Gibson I have or calculated out according to a "fret calculator" at Stewart MacDonald on the net if it is an odd scale.The frets are then cut with a special miter saw in a special miter box I have set up that cuts only a certain depth. The fretboard dot holes are then drilled at certain frets..allowing me places to screw the fretboard back to the specific neck form and the fretboard is run through the bearing bit on the router table to its proper size and shape(except the tail). The fretboard is left on the form for support and the frets cut and hammered into the slots by hand with a little extra hanging out the sides.once the frets are all in,the fret excess is run over the belt sander to trim off the excess,bevel the frets and the edges of the boards. The fretboard is then removed from the form,the tail shaped to whatever length and shape is desired on the belt sander and bandsaw..then the dots are glued in place..The fretboard is ready to be glued/clamped on the neck. I keep a decent amount of precut(width and thickness) exotic species for bridges,fretboards,and neck blanks..along with surface wood and side pieces..usually only need to be cut to length and finished shape..I do large amounts of the boring work at one time(thickness sanding for hours)..saves me a ton of time when I can just grab a piece and cut it to length later..I try not to need to set up a tool for one 5 minute job(other than changing router or drill bits,fences)..then reset the tool for another job,etc..etc. If I build several at once..I do the same step for all of them(for instance shape necks)...then go on to the next step(make all the fretboards) ..then the next step(fret all the boards)..etc..etc..
That is so cool to know how things are made. I like working with wood. Nice how you use the router to shape the square fret board while attached to the tapered neck form. You've got everything down to a science. Doing all operations in quantity is how I do stove stuff. Remember the video of how I emptied the bottles of Venom energy drink...in quantity. When I started building,I spent months just putting together forms and jigs..just to save time later..try to keep the construction costs down to where there is some profit or wages in building them..Like your stovebuilding.. Reminds me of my wood burning "Woodgaz" stove. I could not make jigs or fixtures for it....all hand work. In the end I gave it up. Not enough wages for the time put in.